There were some more boys in the family having birthdays and they happen to all be Star Wars fans! I wanted to crochet a Star Wars character and I decided to come up with the pattern myself to be able to share with you in case you wanted to make this as well. Meet Yoda. He’s little, but he can still do great things! My daughter told me she wants one in purple after meeting him 😉 lol. Remember, these instructions can be adjusted to what you have. Feel free to try different hook sizes, different types of yarn, etc. And, I forgot to meaure him before I mailed him, but he was about 5 inches maybe? No bigger than my hand for sure. *Attach eyes (see instructions on package) and stuff head with stuffing. Switch to brown color for the body. Simply use a sl st to bring in the new color. *Please note: This next part is connected to what you have done so far. But, think of it as starting over. The first 9 sc’s you make will be overlapping, as there were only 7 stitches left open after doing round 10 above. 9. Stuff the body with fiberfill, etc. 10. dec until closed. Fasten off. 9. sl st in next stitch leaving tail to sew it on the body. *Sew arms on the body. There is no need to add stuffing to them. The jacket was just rectangular shapes using off white yarn with a size H hook. Here is how I did it if you would like to try it. 1. I created three pieces like this. I just crocheted a chain that was as long as his back then did rows of sc’s until it was the height i wanted it. I made it from the top of the neck to a little above the bottom. The smaller front sides were the same height and almost equaled half of the back pieces length. I left a long tail on them all for sewing the pieces together. 2. I then sewed the small sides onto the back leaving a hole big enough for the arms to fit through. 3. For the hood, I just started a little in from the front top edge and used sc stitches across until it was almost at the end of the other side. Then I kept making rows using sc stitches until it was long enough to go over his head. 4 &5. I fold the new rectangle in half and sewed the edges together. I squooshed the point in so it would look more smooth. Update: A fabulous crocheter, Cheryl, came up with how to do the jacket all in one piece! Here are the instructions. Row 7: Ch 3. dc in next 3 sp. Ch 2, skip 2 st, dc in next 8 sp. Ch 2, sk 2 st, Dc in 4 remaining st.
Row 8: Sl st in first 4 st. sc in next 12 sp ending at front edge of the other arm hole made in previous row. Row 9 – 20: Ch 1 turn, sc across. The belt was just a ch with a row of sc. I just made it long enough to go around and tie. Want to learn how to crochet? Check out these tutorials. Done with work wish to be I so crocheting hooks the force be with! This little guy is cute beyond words!!! Thanks for sharing your crochet pattern! This is INSANE! Can’t wait to start! No way — this is too cute!!! I have to make this. Love it!! I always get inspired by your cute creations. Maybe this will be the project to jumpstart my crafty side. Thanks! Oh my gosh! My oldest son just LOVES yoda! I would totally win the Mother of the Year award! And just in time for Mother’s Day! OOH! Thanks for posting! Totally cute! That is the cutest little yoda I’ve ever seen. I might make one for myself since I have no little ones. That number just let’s you know how many stitches total you will be doing for that number. So when you do 2sc in next stitc 8 times it equals 16 sc stitches for that instruction. One dec equals one stitch too even though you are hooking in two stitches. Hope this helps! Where oh where did I stash my green yarn. Love this!! This would be a great gift for some one I work with! 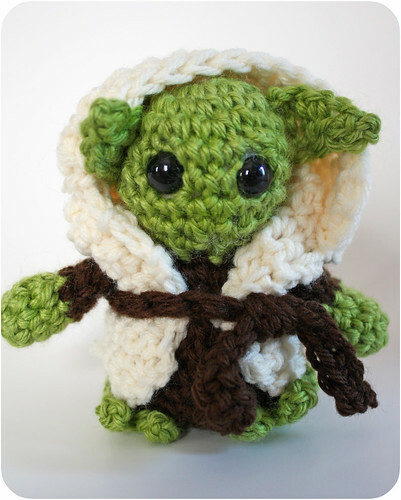 woow, this is so kind of you to share the pattern with us, my husband has been asking for a Yoda for ages and now I can make one for him! My dad would flip out if he got this for his birthday. If I could bare to part with it anyway! Thanks for sharing! I have blogged this and linked back to you on my blog http://uniqueunusualandinterestingart.blogspot.com/2010/05/little-yoda-crochet-creature.html and at Neatorama. He is also going on my Stuff To Make list. Thanks for sharing this with us! Okay so I was away for a few days and totally missed this. How impressive! You go girl! That is so cool! Looks like I’ll be buying Yoda-coloured wool next! Thank you so much for the pattern! Mine turned out a little differently (had to do the head and body separately then sewed together). <3 YODA! What a wise project… I must add this to my list of wee fun things to do! Thanks for sharing! 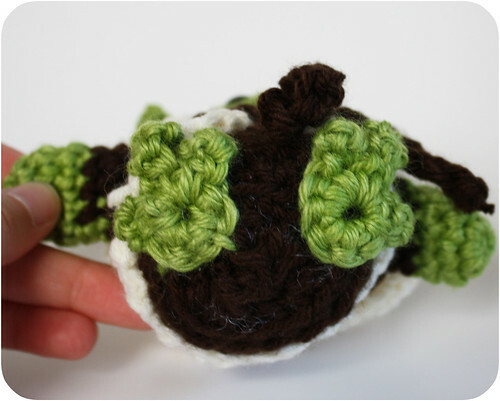 I got to this website by searching some cute things to crochet, and this is by far the MOST adorable crochet-thing I’ve ever seen!! Can’t wait to get home and try this, thank you soooo much for sharing this on the internet!! Hi, I love your blog – so full of great ideas and tutorials. 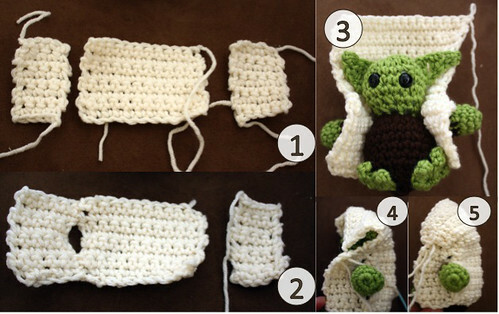 I’m making your adorable little Yoda at the moment. Just a question about the pattern. I’m working on the head and can’t make out the bit “5. sc around (24), 6. *dec, sc, sc* 4 times (16)”. I get 20 or am I doing something wrong? Helloooo 😀 I absolutely LOVE this mini-yoda and have bought all the yarn and stuff to start it, started this afternoon and am a little confused by the pattern… currently working on the head/body section but specifically round 8 of the head where it says “Repeat #6″”. There is not a final amount of stitches given at the end so I don’t understand what I should be repeating because surely this will be smaller than round 6 and not 18 stitches at the end?! Then it says dec around 6 times at round 10, but then for the body round 1 states to “*sc in next stitch* 9 times”– this would indicate the body and head are joined, but surely after dec’ing so many times there isn’t 9 free stitches to start the brown wool and body? I may well be being stupid here but hoping someone could shed light on my problems, my dad is patiently waiting for his yoda….! It should say repeat round 7 🙂 I will change that. So you would do 18 sc around. You are right. They are joined and there will not be 9 free stitches. You will be overlapping. Just think of it like you are starting over again once you get to this point, even though they are connected. Does that make sense? I love this! I just recently started crocheting little critters and monsters! My husband saw this and said he wanted one! Thanks for having such a great blog! Could anyone explay what “ch” “sc” and “dec” means? Cute he is. Want him I do. 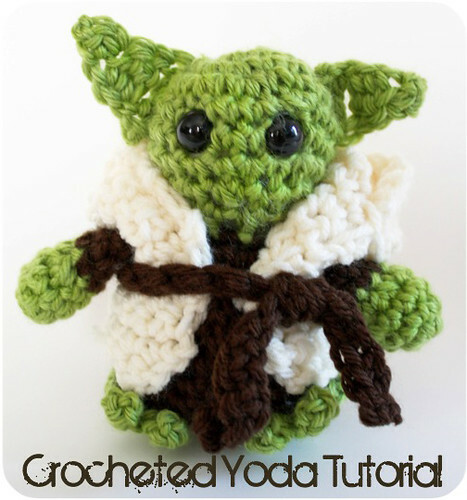 Tempted to learn to crochet I am. I would love to know the type of yarn you used, like the brand name. I msde it sort of as a joke for my 22 yr. old son. He loved it, and posted a picture of himself and the Yoda on his Facebook page. WOW, mom is a hit, too. Thanks. My sister made one of these for my son (who loves star wars)! It was a hit! I have glued on small round circles cut from felt before. If you use fabric glue, it makes it really super hard to get off. But, it is still doable. So, I would suggest just using some yarn or embroidery thread and “sewing” eyes with it. Saftey eyes. You can buy them at any craft store and they come in any size. Sized in mm. They have licking backings that don’t come out. This is amazing! I totally made it and it was a HUGE success in my wonderfully nerdy family! Thank you for this wonderful pattern, you are very talented. I just wanted to let you know that I linked to this pattern in my most recent blog entry and that I also linked to your blog and gave you credit and am hoping that it brings you some traffic from my readers. If you would like to read the post, here is the link. this is the awesomest yoda i’ve seen! this is the most fantabulous yoda ever!! I made him!! Granted, he looks like he’s been chewed on by a wookie, but I made him- yours was the first crochet pattern EVER I had the guts to follow, and I am really happy with the little guy. So is my boyfriend, he actually loves the wookiefodder. Thank you SO much for the tut, you made me happy! I LOVE your yoda. I made my own yesterday and he’s super-cute. But now i’m trying Cheryl’s robe directions and i’m super confused on Row 7. What spaces? I understand if there were chains the previous row, but that’s not the case here. Can someone help??? Also, i never did understand ” the first 9 scs will be overlapping as thre were only 7 stitches left open after doing round 10″ but i fudged that. So i guess what i’m saying is that i LOVE your yoda, but the patterns are confusing in certain steps. Please help with the robe??? Thank you! I wrote this in because people were thinking the row 1 with 9 sc should be equal to the previous #10 because it was continuing. So if you had just done number 10, you have 7 stitches from that round (dec 6 times into the 13 previous st leaves you with 7 left because the left st is left open), but then I say sc 9 times around. That means you are going past the end of the previous round. Like starting over instead of continuing. Oh my FREAKIN GOODNESS! How cute! I have several Star Wars people in my life, and I can crochet, so this will be a Christmas prezzie (or 2) for sure! Thank you! If you ever come up with a pattern for Mr. Spock from Star Trek, I will make him too. 🙂 Just found you through Sew Homegrown with your rag bag tute. Thanks for sharing, Love your stuff! Thank you so much for this pattern. i’ve been looking for a free pattern of any star wars characters. i’m planning to give it as a gift to Casey James (from AI) if ever i will meet him. Love this so much! yoda is awsome. i have given everyone in my entire family a nickname. and my cousin lil rex will love this of course he is called yoda. thank you very much for putting this on here. Your Yoda is best! Thank you! Imade it to my grandboy. Thank you for sharing this wonderful tutorial. I made Yoda on my own. It was fun to do. “*dec, sc, sc* 6 times (18)”. I’ve looked online, but still don’t know how to do this step… Would you mind terribly explaining to this novice how to do it? Thank you so very much!!! Then you follow that by doing two single crochet stitches (which I’m assuming you know if you have gotten this far ;). A “dec” counts as 1 stitch even though it’s going through two different loops. just confirming that the “dc” is for double crochet and not decrease? thanks! I made it. I went squee. I stuck a key ring in his head, and now he rides around on my schoolbag. Thanks so much! First of all: what a cutie! It’s beautiful and i really want to make it!! I’m from Belgium and I’m more comfortable with my own language, so I’m translating it (that goes well), the only problem is, I don’t know wich size my crochet hooks have to be. You say size G and H, and i looked on the internet for some translation in numbers, but i couldn’t find it.. Do you know which size it is in numbers? I used D & E sized needles but mine was bigger. I don’t get it??? It’s okay 🙂 You probably just made your stitches bigger that is all. On things like this, I don’t worry about doing a gauge which is where you do a sample to try and get the same size as the pattern creator did. If you want him smaller, try making your stitches tighter or use smaller needles. If your yarn was thicker, that might add in size as well. Thank you so much for the pattern. Mine turned out a bit differently, but that’s ok. My boyfriend LOVES Star Wars so I know he will just love this guy. Thanks again! Just the perfect gift! I’ m delighted and thankful! Merci pour le tuto, je vais le faire pour un petit garçon fan de Yoda. Votre tuto est le seul que j’ai trouvé beau. Mais il va falloir que je comprenne les explications ne connaissant pas trop bien les symbôles anglais. Bonne année à vous. Great job!! Have a little 7 yr old who will love this in his Easter basket. Muchas gracias por el patrón,es extraordinario. Thank you so much for sharing this. I am still a bit of a beginner so I am going to try to make him before I tell my children and husband. If all goes well I will have to make one for each of them, me too of course. Yoda is our favorite. I am so excited to try it, thank you again. how fun was this!!! I (being known for my “itty bitties”) made mine a smidge smaller than an inch tall. The next one will be smaller! I am having a bit of trouble with just the hood part but I will play with it and see what happens! Thank you! cute and fun! My Brother in law is a great Star Wars fan, and he sent me a link to your mini-Yoda a couple of years ago – but I’m Danish and didn’t really have the courage to follow the English pattern, so I translated it into Danish (changed the sizes of the hooks in the proces.) It ended up being quite a cute little fellow. Now, I want to ask if it’s ok for me to post the pattern in Danish on my blog (http://naermestlokkelig.blogspot.dk/) – as long as I give you credit for it by linking to your blog? Sure 🙂 Just come back and leave a link here so others who might be in that position can see where to get to it as well. Thanks! Have you put this pattern on Ravelry.com? I have not done so at this time. Can these be made to sell at craft shows or does that violate the copyright laws? I absolutely love this pattern and am trying to find something simple to make and sell. I allow for any of my patterns/tutorials to be used to make things to sell 🙂 Thank you for asking. I don’t know if anyone else has asked this or if it’s just me, but I’m terribly confused as to how I’m suppose to do the arms according to the instructions. Is the 5 sc into ring the same as sc in the middle of the ring? And is the 2 sc still in the middle of the ring? Is it sc 1 then sc into next chain? Or is it sc in next ch around for a total of 10 times? I’m sorry if I’m being stupid, I was just very lost. Thank you so very much for this adorable pattern… it’s made for a very cute and quick Christmas present!! I Love this pattern. Im making it right now. Just finished this today. Made it for my daughter’s teacher who likes Yoda. I think is a great pattern as he turned out great. After attaching the ears I ran needle through outer edge of bottom of ear and out through pointy part of ear, then continued through top back towards bad of ear and tugged until ear developed a cup like appearance then hid tail. Made it look a little more yoda-ish. I also left a little loop on hands so he could wield a lightsaber or in this case a green crayon cause one should never take weapons to school. For this pattern, I thank you. I can see that you already have a ton of comments, but I had to leave one anyway. I just finished making Yoda! He is very cute, and the pattern wasn’t difficult to follow. He took me about 4 hours or so to make, with breaks. I love your pattern!! I was hoping to get your permission to sell these for my fundraiser. I am walking in Avon 39: The Walk to End Breast Cancer this summer and I am trying to raise $1,800 for the cause. Please let me know. Thanks!!! Chain 3. DC in next 2 spaces . Ch 2, skip 2 st, DC in next 8 stitches, chain 2, skip 2 stitches. DC in remaining 3. Row 8: Sl st in first 3 st. sc in next 12 sp ending at front edge of the other arm hole made in previous row. Super cute pattern. My Yoda came out adorable! Thank you. I love this pattern. I made three Yoda’s, one for myself and gave two away. The recipients’ loved them also. Thank you so much for a wonderful pattern and sharing with us. Will there be more Star Wars to come? Either way Thank you for being so generous. thank you for this tutorial , I have it done! I send you the picture very quickly! Just wanted to say this was great, he turned out lovely and now I’m making another for a friend.